The SIGGRAPH 2018 Studio is a place where collaboration and interactivity merge to create an experience unlike any other. 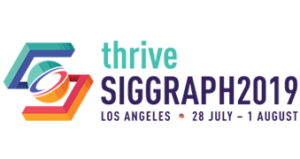 Utilizing both new and old technologies, SIGGRAPH attendees are encouraged to roll up their sleeves and bring their wildest ideas to life.. The Audio Guides are the voice recordings of the Studio contributions in different languages! Produced by ACM SIGGRAPH International Resources Committee (IRC). Special thanks to: Koutaro Nakazato (Japanese), Santiago Echeverry (French), Ivan Aguilar (Portuguese), Gabriel Casique (Spanish), Rick Xu (Mandarin), Patience Lee (Cantonese), Juyeon Hong (Korean), Jihed Jaouabi (Arabic), Phil Gough (English), Bektur Ryskeldiev (Edition), Kim Baumann Larsen (Edition). Below are links to written transcripts of the Studio content in multiple languages. ACM SIGGRAPH is a thriving international organization. Everybody who shares ACM SIGGRAPH’s love for computer graphics and interactive techniques is warmly invited to join ACM SIGGRAPH and attend SIGGRAPH or SIGGRAPH Asia. In addition to your support as a member, we need your help as a volunteer to put on our programs! Please see the volunteer section or contact someone involved with our current programs. This site is maintained by volunteers working in many programs of ACM SIGGRAPH. We thank you for visiting! If you have questions about the site, please send a note to our content manager.